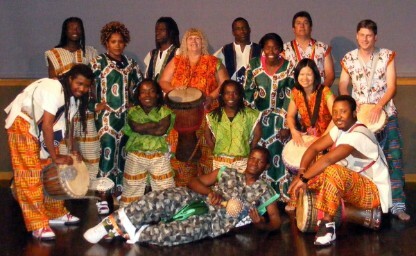 Gbozé is an international African drumming, dancing and singing troupe. Troupe members are in France, Africa, and the United States. Gbozé shares the roots of their history and culture through traditional West African drum and dance. Excitement abounds and everyone experiences a little bit of Africa as the drums beat the tribal rhythms! Come join us and learn the art of African folk traditional music and dance! Group picture taken at rehearsal of Senin show in the summer of 2009 at the Joe Crowley Student Union University of Nevada, Reno. English translation for link above. WEST AFRICAN DRUM AND DANCE CLASS RETURNING TO RENO SOON!! !